The Quietus | News | Back To The Phuture Preview: Gary Numan Speaks! Back To The Phuture Preview: Gary Numan Speaks! Gary Numan: "I've wanted the live thing to move up a gear for some time but it's taking me a while to find the right way to go. Projection is a cool thing but it's very easy to do it badly. I wanted to make sure that our first serious move into projection would be a significant one. Finding the right way to do it has not been easy but I'm very happy with what we have now for the Manchester and London shows. If the fans like what we are doing then I will continue to develop the ideas and expand on them for the forseable future. We worked closely with a company called Digital Insanity who have ben a huge help in putting all of the ideas into a useable format." Can you tell us a little bit about your history with John Foxx? 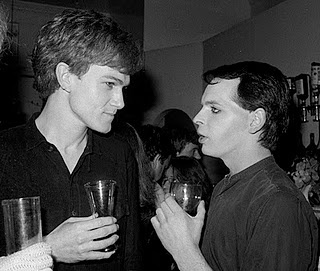 GN: I first met John Foxx soon after I had my first big single. I was in awe of him to be honest. Ultravox, the John Foxx version, had been very influential on what I was trying to do in those early days and I thought John was a very enigmatic frontman. It's an honour for me to be on the same bill as John, I owe a lot to his genius to be honest. He was on his third electronic album when I was still making my first. He was years ahead of the game. And you've also got Daniel Miller DJing. Were you aware of The Normal at the time? GN: I was aware of The Normal, yes. In fact I asked Daniel to support me on my first big tour in 1979 but I think he was busy setting up Mute. Daniel's contribution to electronic music, to music in general actually, has been quite phenomenal. It's great that he's a part of it. Speaking of early days of Mute, someone told us that you tried to sign Depeche Mode to Beggars. Is this true? GN:Well, I saw them play live at a club in London shortly after I'd had my first success and I thought they were great. I mentioned it to Rusty Egan, who was one of those larger than life and twice as sharp characters at the time and someone that seemed to know everything about everything, and he told me that he had already got them with someone else so I didn't pursue it with Beggars Banquet. I have no idea if what he said was true. Probably not. You've got a track with Motor, who are playing with you and Foxx tonight and tomorrow, out on Monday, and you're also on the new Battles album. Can you tell us a little bit about these collaborations? GN: I met Battles last year when we were touring the United States. They asked if I would be interested in collaborating on something which was cool for me as I think they're a great band. The South Central track 'Crawl' has been around for a while now so I'm glad to see that coming out. That's a great track, really pleased with it. Recoil are amazing. I've been a massive fan of Alan Wilder and his Recoil project since he started it. It's just so impressive. He played with us in Chicago last year and the show was amazing, plus me and Ade Fenton DJ'd at two Recoil shows in Germany recently. I'm blown away that Alan is doing the Manchester show with us.